Why is it so satisfying to use a pattern multiple times? 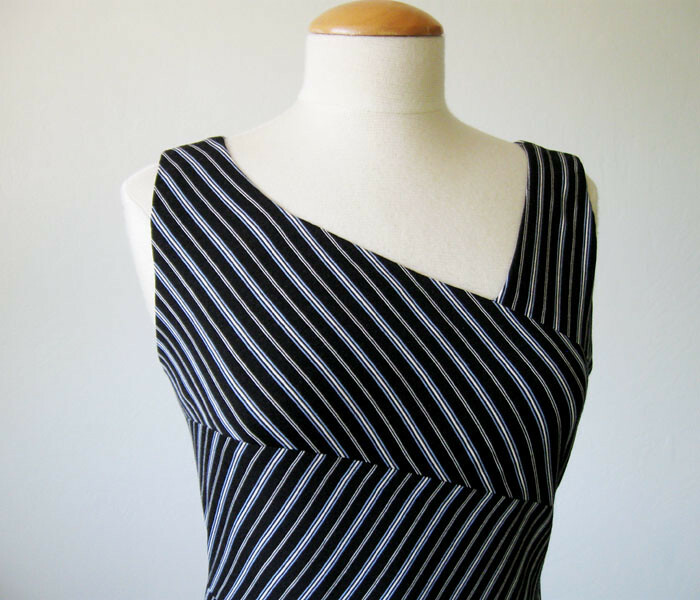 I know I'm not the only one that derives some extra sewing pleasure from pattern reuse. For my part, it mostly appeals to my thrifty side. 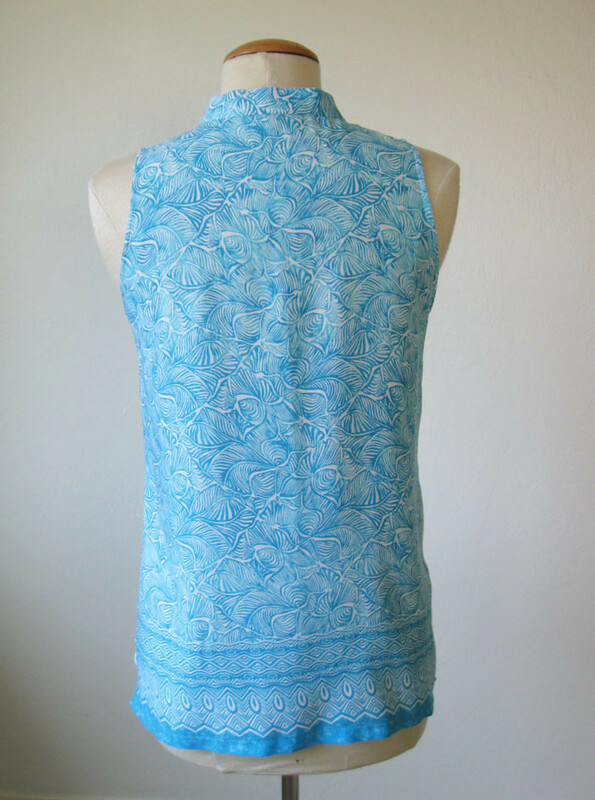 By making another version that is perhaps one fewer new pattern purchased. Plus there is the saved time because I have already done the pattern fitting. So what did I get my money's worth from this summer? It's the very simple but elegant New Look 6677. Which in fact cost me nothing as I found it in a grab bag of patterns that my friend Alice gave me some months ago. 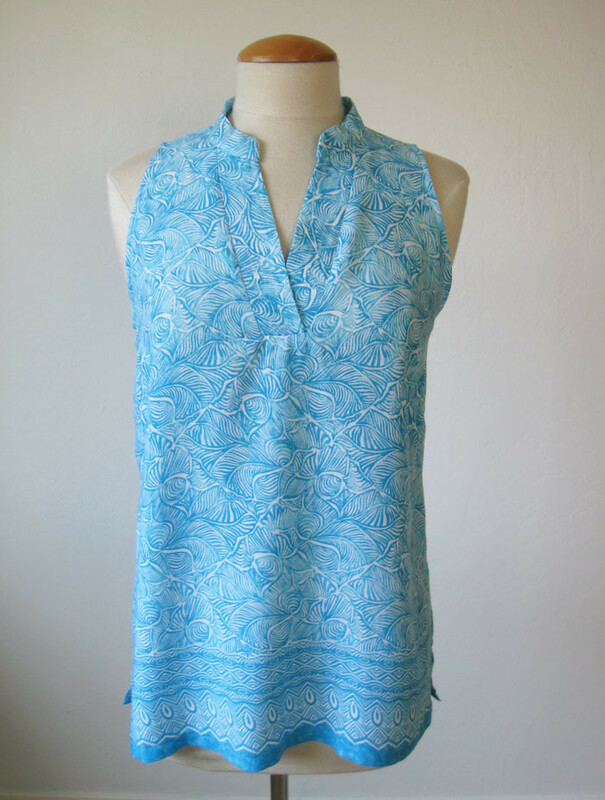 And used first to make her this blue eyelet top - a complete success. And then I made another version for myself. 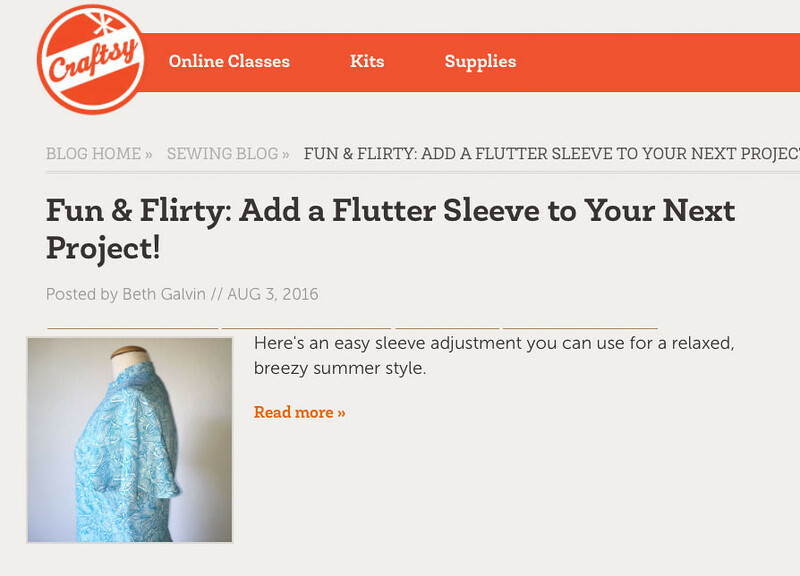 I have neglected to share a few of the Craftsy sewing blog posts that I had published recently - I have been doing some how-to posts on sleeves and wanted to do a post on how to design a flutter sleeve. Which is not really my favorite but it is kind of useful, and looks really pretty when used on the right top or dress. These woven rayons and rayon challis are really nice fabrics to sew, although they do wrinkle a bit too much for my taste. But for dresses and blouses they are vastly better than quilting cottons, the drape is perfect for a lot of styles. A look at the flutter sleeve. Once finished I think this didn't really go with the rest of the garment. A flutter sleeve looks much better with an open neckline, so you can guess what I did later. Here is the link to my Craftsy post on how to create the flutter sleeve. I do think it is a nice sleeve used in the right spot - some people just don't want their arms to show, or require a bit more coverage but a regular sleeve seems constricting or too casual. This is a good sleeve to try if you want to avoid doing a bicep adjustment. Basically everything in the design book that I use can look fantastic or goofy - it just depends on using each design element in the right spot. For some reason I think of these sleeves on a bias cut satin evening gown in a 1930's black and white movie with a glamorous vixen running around with a fur stole and gardenia in her hair. And here is a look at it on me. While I love the fabric I didn't like the look very much. Perhaps it is the proportion, the top might be kind of long but I was going for the tunic look. 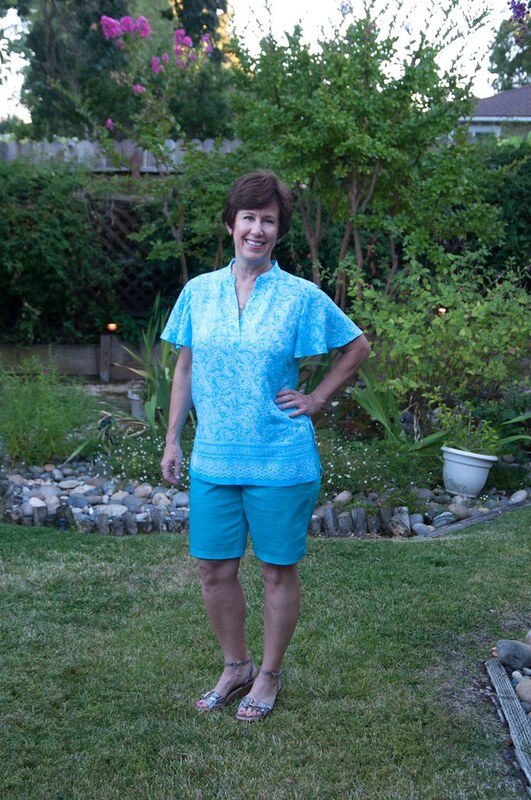 Also it would look good with white jeans but I think it was about 100˚F when we took this picture so shorts it was. It seems too covered up with that collar which works so well with the sleeveless version. As evidenced by a lot of my other posts, I am a proportion scrutinizer. 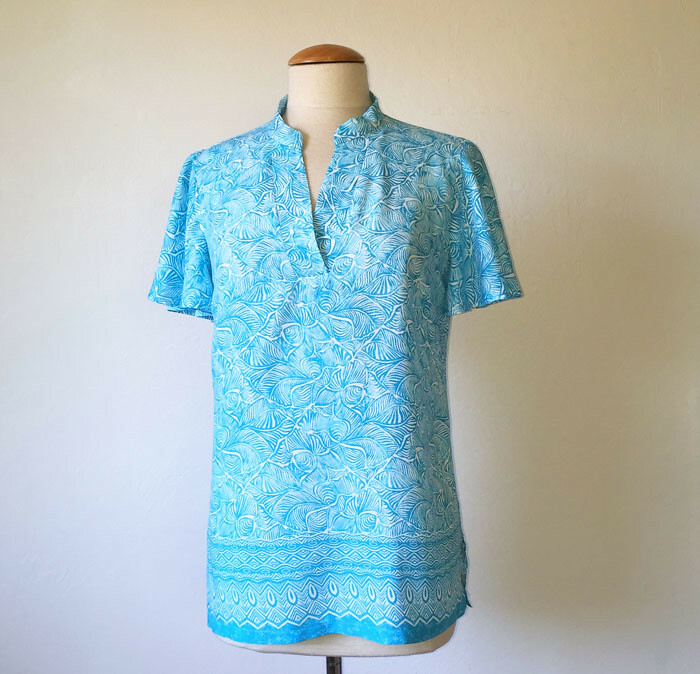 I think that a part of sewing experience is being able to evaluate the shapes and proportions of a pattern or garment, not just as designed but as it looks on your own body. You can guess what it did next. Actually since I had my doubts on the sleeves but needed to photograph for the Craftsy post, I just machine basted them on. Then I let this one marinate for a while, even putting it on one evening as I was going out to meet friends for a drink - but it just didn't feel right. So back on the dress form for some more contemplation. And finally this happened. For me so much more wearable. And here is a terrible iPhone timer photo taken late in the day when the lighting wasn't cooperating, thus the color looks really off. I like it so much better and have already worn it a few times. Plus tomorrow it is supposed to be 100˚ here again so I am still wearing my sleeveless summer tops despite autumn being just around the corner. Proved by the number of leaves falling in my front yard and the bedraggled look of all the plants which are very tired and just waiting for some much needed rain! 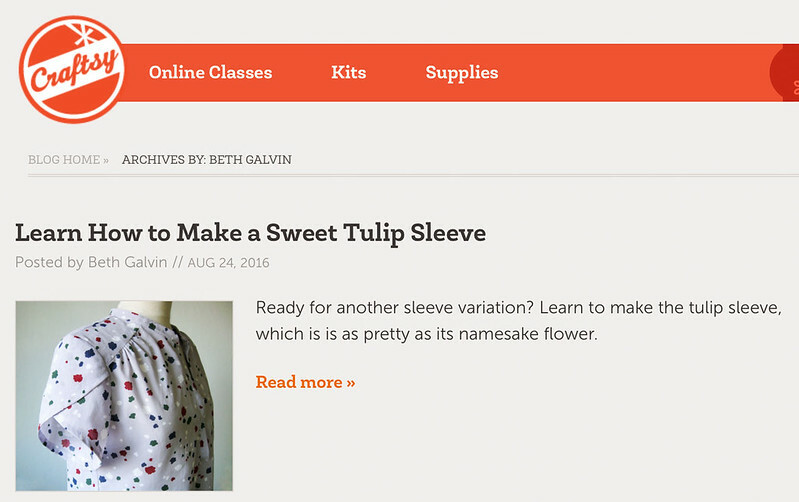 On the theme of sleeves I also did another recent post for Craftsy, on how to do the Tulip sleeve. 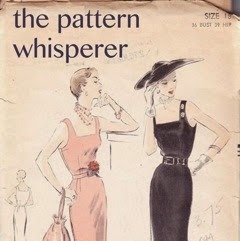 Which is another variation that cleverly uses the existing sleeve pattern piece and is them modified. Which makes it easy to sew into the garment because you don't change the sleeve cap at all. Check it out! And that grey dotted top pictured in the post was a test garment for a new to me New Look pattern, since I had such success with the one at the top of this post I checked out their pattern book for another and found this one, New Look 6374. Super cute pattern, hideous on the pattern envelope, and I have already made a couple of versions. If you are interested in sleeve fitting and sewing, I have done a number of posts on Craftsy on various sleeve-y topics. Here some of my previous ones if you want to take a look. And I have another one in progress, soon to be published, deconstructing sleeve patterns with explanations on all the various markings. Whew! sleeves are an endless supply of topics, who knew? 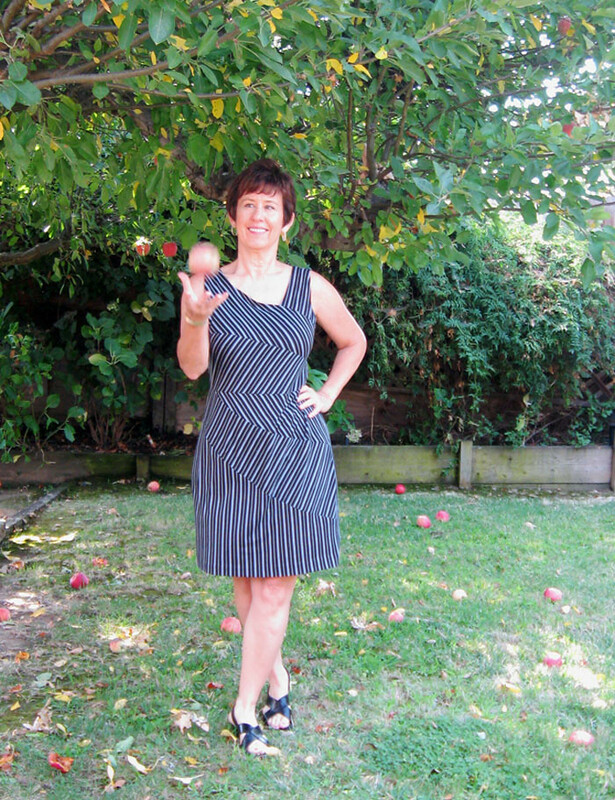 Thank you everyone for your nice comments on my previous post, on the striped and pieced Burda dress. I was looking at the BurdaStyle website and see a version that is color-blocked - that might be my favorite version by far. 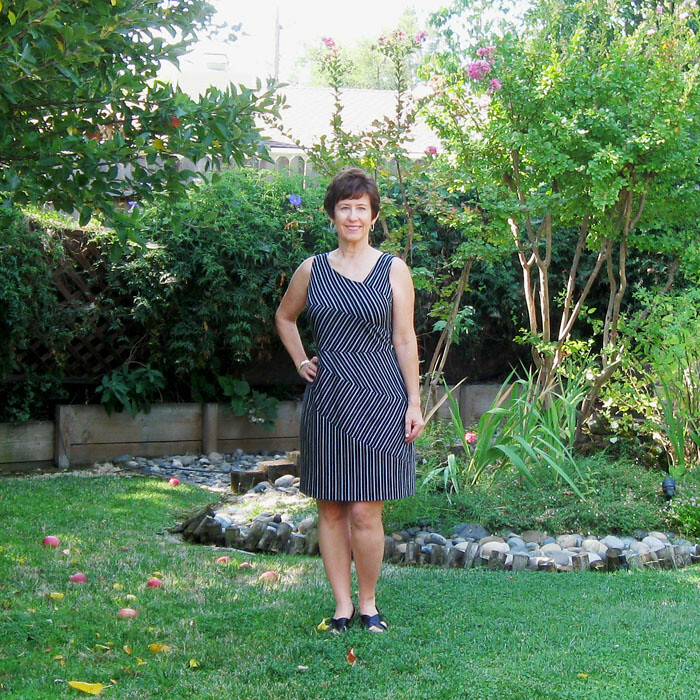 I am really happy with the fit of the dress so that pattern will go in the "perhaps to be sewn again next spring" category. 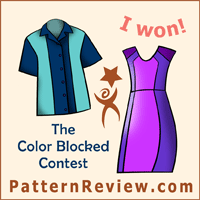 It would a great one for color-blocking using up smallish pieces of solid color fabric. 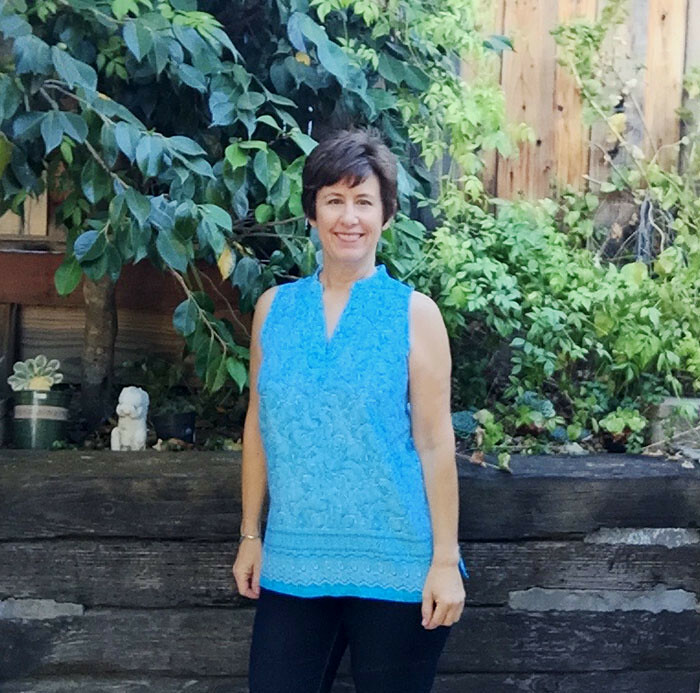 It interests me that a lot of readers often suggest adding a cardigan in a bright color. I appreciate the suggestion - but I never wear cardigans :) In fact I think I might have two? 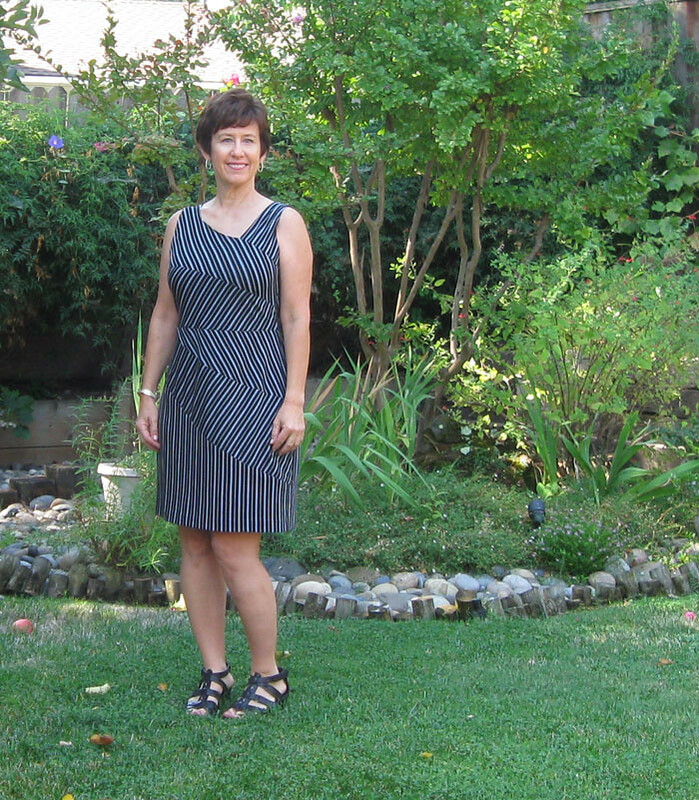 I'm just not a cardigan wearer - either it is a pullover sweater in the winter because it is chilly or I wear a sleeveless dress because it is very hot here - so cardigan weather doesn't really happen. Plus if I sewed up a nice dress then I don't want to cover it up with a cardigan! Yep we all have our wardrobe quirks. Now jackets are another story. Because it was so worth it - one of my best friends moved up to the great northwest (as I call it) about 18 years ago so I've had the opportunity to visit often. While I always prefer palm trees to pine trees it is beautiful and green, and their food/wine scene is great. My friends just bought a vacation house on San Juan Island - so we did the ferry trip over there and I got to see that, very fun. I have a feeling I will be back. They have dungeness crab almost all year round - lucky them. It's a winter treat here in NorCal and last year the season was delayed due to environmental reasons. Which is tough on the local SF fisherman and also not good for our Christmas table. But I will always be partial to the Golden State. 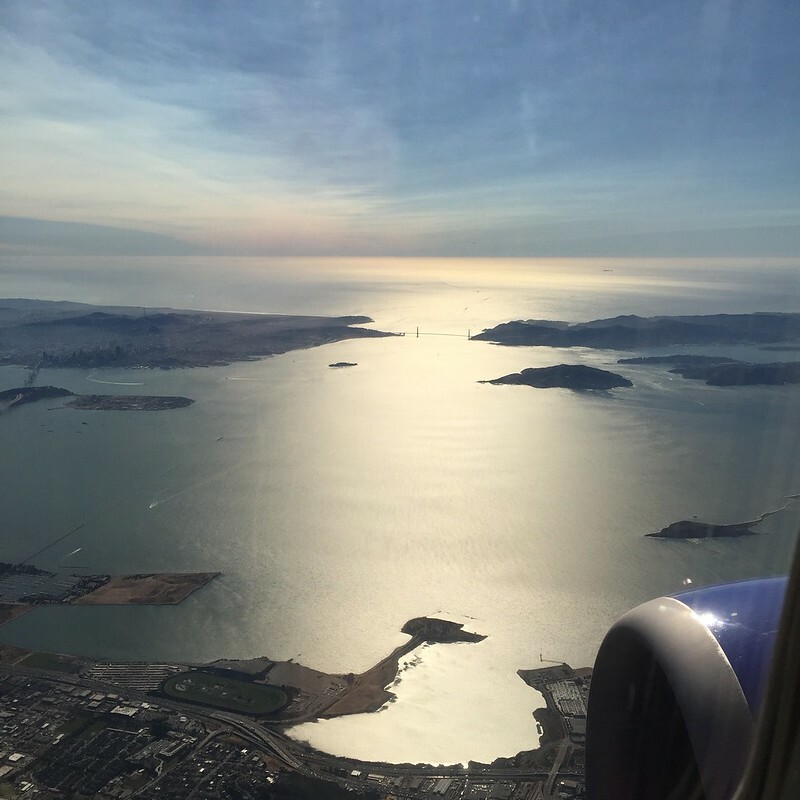 So I couldn't resist taking this picture out the airplane window - look at that sunshine over the Golden Gate Bridge. And you can even see the Farallon Islands, which is our benchmark for how clear the sky is over the bay area. That is tiny Alcatraz island in the middle, and then Angel island on the right, which is a state park, has ferry service and you can even camp. Although I have never been there! Here's something I sewed a few weeks ago and I just can't warm up to it. Which I attribute entirely to the color. Or non-color, to be more accurate. As I have mentioned before, I just don't like to wear black very much. Or solid navy blue for that matter. Let's include brown in that category, and beige. Just not a fan of any of those colors. On the other hand if it is a bright color then I am happy. Actually that is the bottom line - I think I'm just one of those people who react to color a lot and particularly bright and saturated colors. Which is a long way round of saying that while I really like this style and shape, and the actual fabric is quite nice, but the final result is just not giving me a thrill. Also it is really difficult to find vertically striped fabrics. Although when I found this at Stone Mountain the rational side of my brain told me "oh this will be really suitable for that pattern, and make a nice and interesting wardrobe basic". I saw this pattern in the April issue and knew I wanted to sew it. 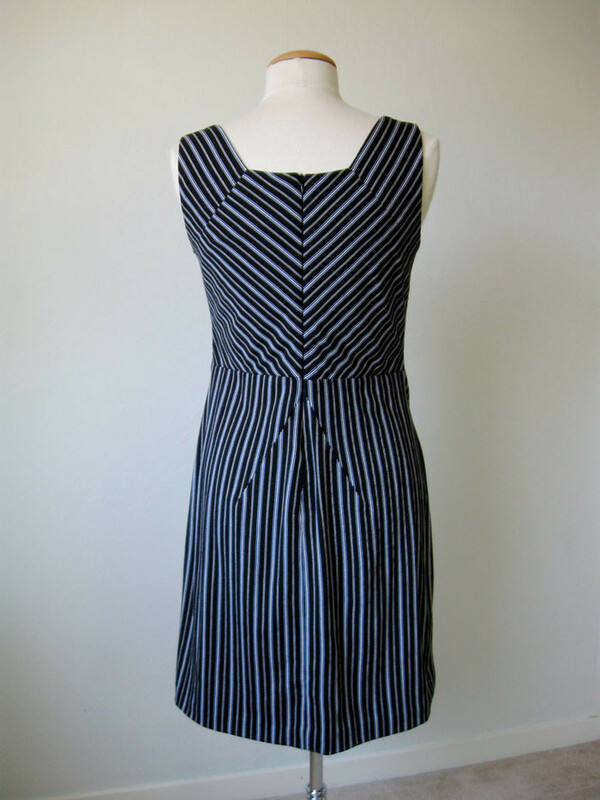 But just needed to find the vertically striped fabric. I think I have seen other versions on line, particularly this version which is in a color way that I love. 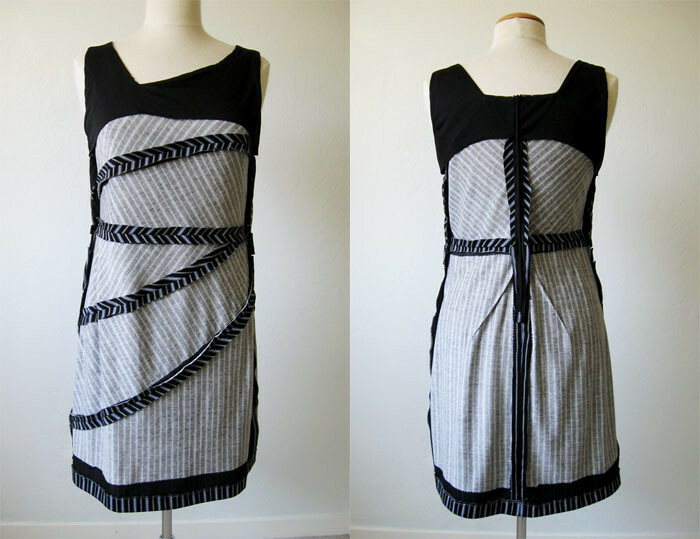 Her stripes are all going the different way than mine, I think she used a horizontally striped fabric and rotated the pattern pieces. In any case I wanted to sew it like the pattern was designed, also I have something where I cut a knit with disregard for the direction of stretch and will never do that again! By the way, I don't buy the Burda magazines, I just purchase the PDF's of patterns I want, which is maybe one or two every few months. When I look at these photos on my computer the stripes make the images look really messed up - hopefully they are showing up properly here. Front and back on the dress form. I don't think the stripes are supposed to line up in the front at all. To tell the truth I studied the example on the Burda website for a good 10 minutes, then when I traced out all the pattern pieces I carefully added marks so I could make some of the stripes across the bodice seams connect - but really to no avail. I concluded that it was not possible and even not necessary. See what I mean, check out that seam under the bust. I figured it should match (i.e. stripes intersect) at the center front and then it would also do so elsewhere - but of course it doesn't because it is a slightly curved seam, and not a 90˚ angle, in fact all the edges are curved and slice at different angles to each other. So don't bother with any matching. I could have sewed this a lot faster if I had skipped this effort. Although the center back is a different - better - story. In that the is two sides that are mirror images so it does match there which I think looks nice. For what looks like a simply shaped sheath dress I did a fair amount of fitting. I moved that small strap in just a quarter inch where it hits the neckline, just to make it easier to wear. I took it up at the shoulders a bit, standard adjustment for me as I am short. Added a little bit of length to the top bodice piece. Graded out in the hips, after starting with a Burda 38 bodice. Since it is a knit I made it on the slim side, although there is probably about 2 inches of ease in the waist. Sewing details, I think in the instructions - which I did look at - tell you to put fusible interfacing on the seam edges. Which seemed like a bit of work but I just cut a bunch of the strips and then added the fusible to every edge. I think this makes a huge difference in helping to keep the dress in its shape All those asymmetric seams press nicely and hold the curve as designed. I think it might stretch out or just not lay flat without the fusible. One of my sewing mottoes is "always more interfacing" so this project was no exception. I thought about doing a full knit lining but decided it didn't need it, the fabric is nicely opaque and it didn't really need it. The facings provided by the pattern actually worked really well. I use some solid black knit fabric for the facing, and did interface the edges of the facings. 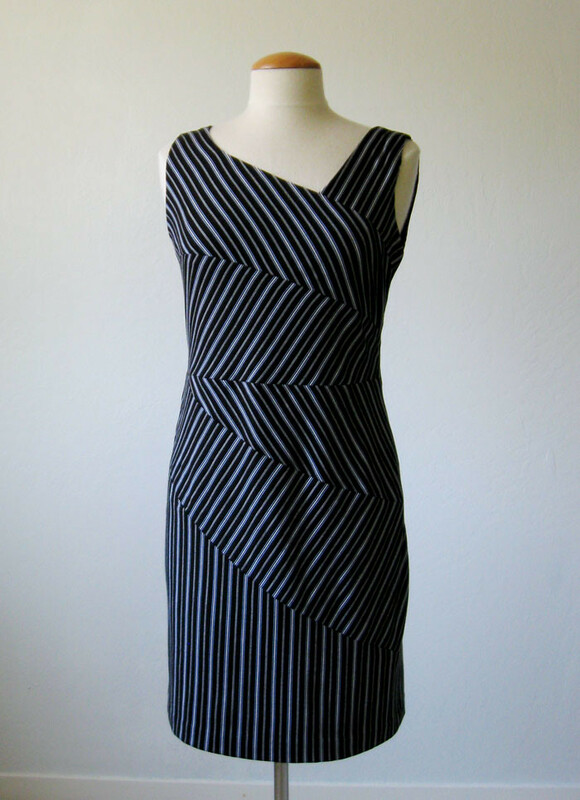 I like the back neckline, but not so crazy about how the stripe worked out along the center seam in the skirt portion. It's hard to tell, even in the close ups but the stripes are white and blue. Not that the tiny bit of blue adds much. I did post a dress form pic of this dress on Instagram a while ago and it got a lot positive comments, so I will be interesting to see the reaction here. Do you ever have a pair of shoes that you like when you look down at your feet but when you see them in pictures or catch a glimpse in the mirror they look strange? These black wedge sandals always get a try-on but actually get worn kind of rarely. Too many straps maybe? You can see in a couple of these photos I have on a different pair of even older black sandals. Which perhaps look better? See it pays to just keep stuff until it comes back in style, ha ha. 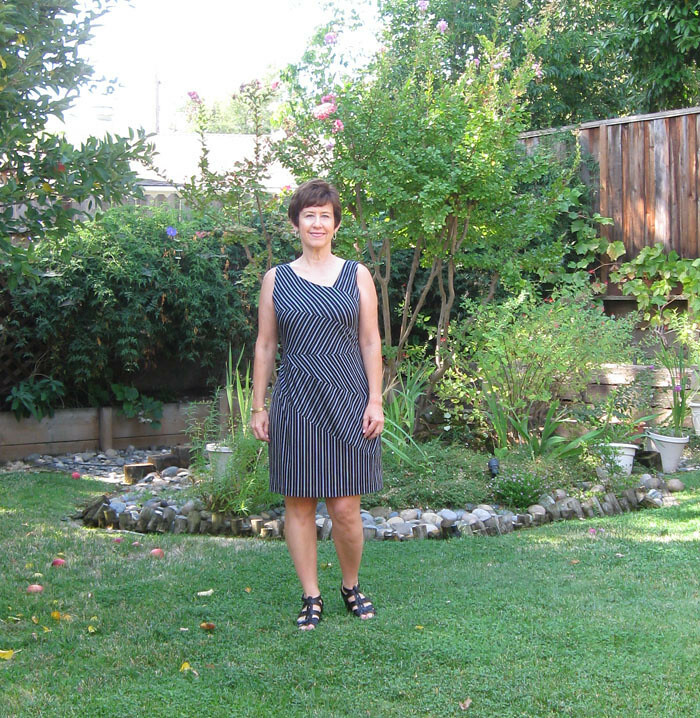 Sewing for fall seems upon us - and my response to that is yuck! Fall fashions, fall sewing, change of seasons - no thank you! Look at all those fallen apples in my yard, yellow leaves, dry grass. I tolerate fall/winter and plan for spring. How about an action shot? It is a shame that this giant apple tree is so productive, because the apples are terrible. One day a couple of weeks ago I picked up at least 100 apples and that was just the beginning stage of the apple onslaught. The squirrels and the birds like them and the shade is nice, Plus the blossoms in the spring are gorgeous. So apple tree reprieve. 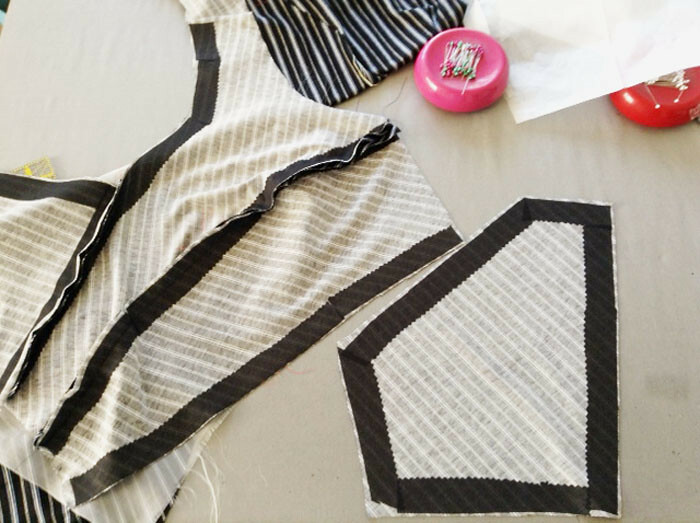 Next up - some striped t-shirts, another silk top which is actually a transitional fall piece, and I have just completed the pattern work (flat pattern adjustment and then a quick test muslin) for a wool dress and an interesting jacket. For my previous post - the drawing for two patterns from my stash, will these readers please email me with your mailing addresses. There is an email button up at the top of the blog under my profile.